Janice Sumpton is a lovely designer located in London, Ontario. We have been very happy to include her designs in many of our magazines! 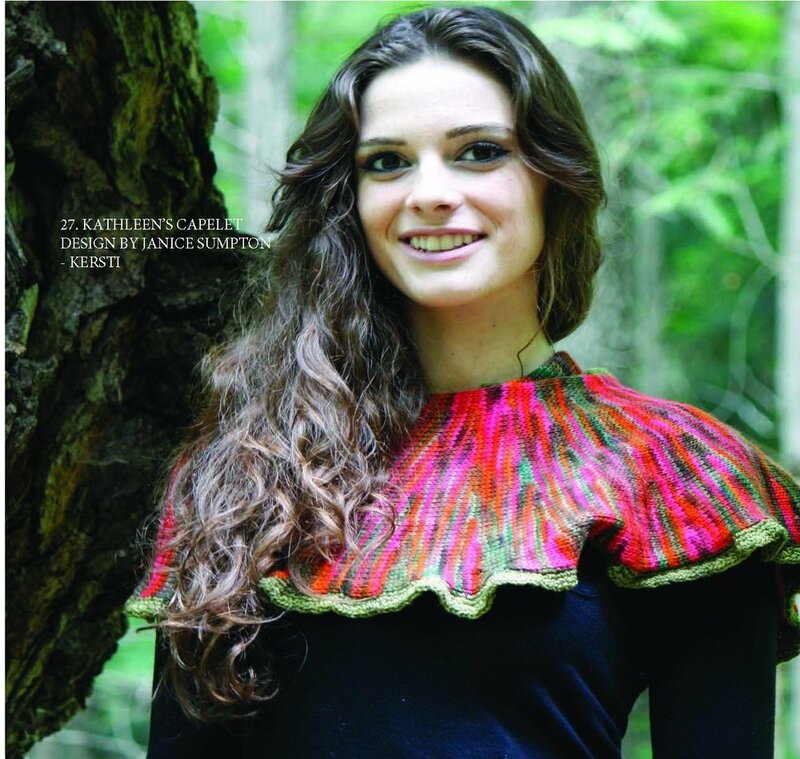 In Magazine 9 Janice designed the Kersti Cowl and Betty’s Garden Cardigan! See below some responses by Janice as well as some of her designs from other magazines. I live in London Ontario with my husband and golden retriever Chloe. I am a proud parent of two grown children Paul who lives in Calgary and Kathleen who lives in London. I am a pharmacist at London Health Sciences Centre for just shy of 35 years, focusing on pediatrics and Clinical Trials. What started you to Knit? My Mom taught me to knit when I was about 7 years old. My first project was a vest.I was very fortunate to be surrounded by family members (grandmothers and aunts) who at many family gatherings would all be knitting. It was very much a part of my childhood and youth and I learned so much from all of them. After university was when I really started to knit in earnest. Knitting for over 50 years. As well as sewing, cross stitch, smocking, hardanger embroidery and very basic crochet to edge a knitting project. Wow, that is such a loaded question. I would say closeness to family given the comfort, learning and bonding that knitting provided. My sister Judy and I wore many handmade garments growing up. As a Mother and Aunt I have knit many garments for my children and nieces and nephew. In the past 20 years living with chronic pain I have found the rhythm and calming repetition of knitting very therapeutic in helping me cope with pain. Sometimes it is simple stocking stitch, while other times it is the focusing on an intricate cable or lace pattern that helps me to manage my pain. In the last 11 years I have ventured into designing my own knitting patterns. I have always enjoyed the beauty of Koigu colourways especially KPPPM. I am very fortunate to have the opportunity to design using Koigu wool. I enjoy creating designs based on inspiration from nature. Jean Moss, British designer for Rowan, Ralph Lauren and Benetton. I had knit many of her designs and then had the privilege in 2007 of travelling on my first Jean Moss Handknit Tour in England where she taught us how to design a sweater. That was the beginning of creating my own designs. At the moment for myself. Cozy in front of the fire at home and outside in the garden when the weather allows. My Cragwood Tunic since it is my first published design inspired by the Cragwood Hotel and beautiful gardens where the design was created. Designs Done by Janice in Koigu!